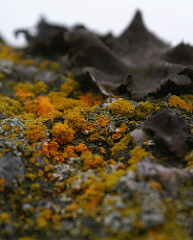 Lichens, fungi, and algae are referred to as cryptogams, which literally means "hidden marriage"—a reference to their means of reproduction, which long remained a mystery to botanists. During World War II, a misunderstanding about the meaning of this term led to a breakthrough of the greatest military importance. Geoffrey Tandy was the museum's "seaweed man." He only ever published two scientific papers, a lack of productivity that seems to have been owing to a hidden marriage of his own, for Tandy shouldered the burden of running two families in tandem. His great moment came when a functionary in the Ministry of War became confused between cryptogamists and cryptographers, and recruited Tandy to the British center for signals intelligence at Bletchley Park, where some of the world's brightest minds were working on cracking the German Enigma Code. During Tandy's stay at Bletchley Park several sodden notebooks holding vital clues to the German code were recovered from sunken U-boats, but they seemed damaged beyond recovery. Tandy, however, knew exactly what to do, for the problem was not so different from preserving marine algae. Obtaining special absorbent papers from the museum, Tandy dried the sodden pages and made them readable, an important contribution to deciphering the Enigma Code.